Detroit has begun the search for planners to envision new development along its East Riverfront of the Detroit River. Penned by the Detroit RiverFront Conservancy (DRFC) and the City of Detroit Planning and Development Department, a request for qualifications is now open until December 4th. The DRFC and the City are looking for multidisciplinary teams with experience in public/private partnerships, completed work of similar scope and scale, as well as an understanding of the immediate context. The ultimate goal of the City and the DRFC is to develop a district plan to stimulate mixed-use development by re-connecting the city to the river. With a growing density of residence in the downtown, public access to the river and new recreational space are a high priority for the nearly 400 acres to be developed. Recent success of the Detroit RiverWalk, as well as riverwalks in other urban centers, has helped to refocus city attention on downtown river areas. Along with economic benefits, ecological improvements are major part of the city’s redevelopment. The new plan will include improved public transit and bicycle access, as well as wetland areas and storm water retention infrastructure. The plan, to be implemented immediately, will comprise of outlines of Community Engagement, Land Use, Infrastructure, Market Assessment, and Stakeholder Engagement. The comprehensive nature of the plan will hope to address the growing needs of the downtown area that has recently seen a resurgence of interest from young residence. Despite past hardships, Detroit’s downtown has a 98 percent housing occupancy rate. With the increase in demand for housing has come an increase in demand for amenities. Along with the proposed developments, three miles of the river front have already been improved, and a planned bike share program may be launched as early as spring 2016. Restaurants, jobs, and cultural attractions have also added to the downtown's revitalization. This includes the $300 million renovation of the river front Cobo Convention Center. The deadline for the RFQ is December 4th, with interviews of shortlisted teams taking place before January 14th. The winning team will have 120 days starting in March 2016 to produce the report, working with the community and civic stakeholders. Mark Denzler, vice president of the Illinois Manufacturers’ Association called the ordinance “a solution in search of a problem.” … The Illinois Chamber of Commerce is also questioning the ordinance, calling it an “overreaction.” “We don’t understand what the mayor is trying to accomplish here. 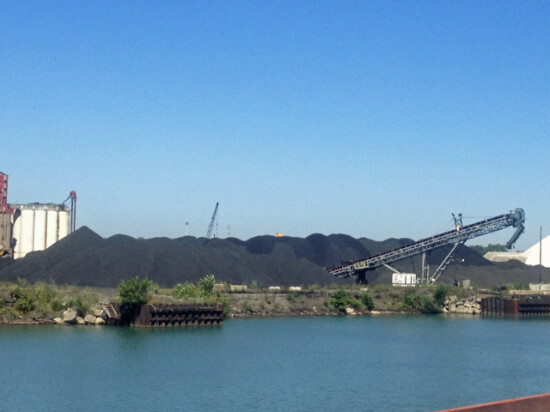 Petcoke and coal have been handled and stored in Chicago for decades with few issues. This seems like an overreaction to one incident – good policy rarely comes from overreacting,” Doug Whitley, Illinois Chamber of Commerce CEO said. KCBX is an affiliate of Koch Industries, the business empire of brothers Charles and David H. Koch. 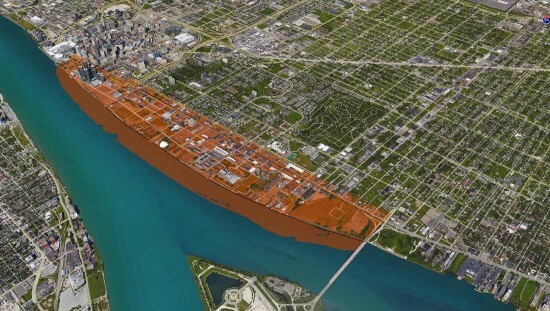 Their company, Koch Carbon, came under fire last year for storing the same material along the Detroit River. Detroit’s Economic Development Corp. gave a preliminary green light to at least 291 low-rise units of housing and retail space along five blocks of the Detroit riverfront. 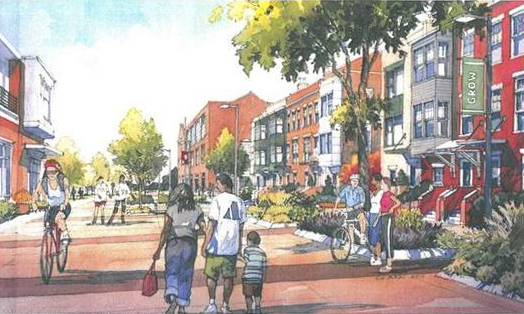 St. Louis-based McCormack Baron Salazar, whose CEO Richard Baron is a Detroit native, would first build the three- to four-story townhouses and apartment buildings along Atwater and Franklin Streets, between the Dequindre Cut Greenway and Riopelle Street. The site borders the Detroit Riverwalk and Tricentennial State Park. If that goes well, the firm could develop a second phase to add 200 rentals or condo units, as well as more retail and restaurants. The Economic Development Corp. is expected to contribute a $1.7 million loan, and could transfer the property to McCormack Baron Salazar for $1 if the developer can secure financing. Much of the funding could come from state funds, as well as a U.S. Housing and Urban Development mortgage. In a city where huge swaths of land remain in a mode of urban decay, even attractive riverfront property near trendy downtown needs a complex system of financing. Baron told the Detroit Free Press he hopes to finish construction on the $60 million project by early 2016.